Windsong Ranch in Prosper, Texas offers all that an active family could ever want, and more. The neighborhood is located 2.5 miles from the Dallas North Tollway providing easy accessibility for morning commute. Why live in Windsong Ranch? The question is rather why not live in this luxurious neighborhood? There are 600 acres of parks, creeks, ponds, trails, tennis courts, disc golf courts and pools to indulge in. The community commons — set on a hilltop overlooking a 2-acre lake — has a resort-style pool, a lap pool, fitness center and cabanas with wifi, making R & R possible on a daily basis. “We were very intentional with how we developed Windsong Ranch, from the family-friendly lifestyle that you will see in The Commons with our resort-style pool and cabana areas, spray park and Windsong Café, to the significant public art at the entry and later throughout the development to the environmental measures including preserving the natural topography and using advanced electronic weather stations for irrigation control,” says Craig Martin, CEO and developer of WindsongRanch. He explains that the goal was to create an enriching environment to Windsong Ranch’s residents. The art-and-earth driven living experience begins at the community’s main entrance, with one of Brad Oldham’s iconic art forms — an 85’ by 25’ mirror-finished, stainless-steel sculpture representing the movement of wind across the prairie, providing a focal point into the development that connects the community to the landscape and emphasizes the importance of art in uniting residents. The piece complements Martin’s drive to promote sustainability and preservation. Martin explains that the 2000-acre Windsong Ranch — which takes up 17% of the city of Prosper — is a community where residents enjoy a dynamic lifestyle defined by a wealth of of natural features, community events and everyday amenities. Large and small events – from movie nights on the floating dock to the Annual Windsong Wine and Music Festival – allow people to come out and experience the Windsong lifestyle and meet their neighbors before they ever move in. With Prosper’s annual growth rate running at 10 percent, and the median household income being $111,987 in 2015, now is a good time to invest. 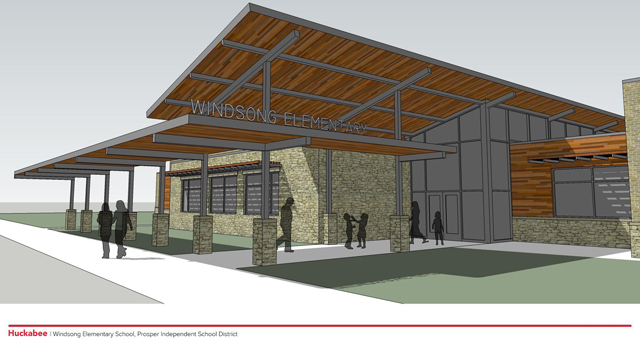 And to top it all off, Prosper’s three elementary schools, middle schools, and high school have received both “exemplary” and “recognized” ratings by the Texas Education Agency and onsite Windsong Elementary is under construction and will open in the Fall of 2016.